The beauty of Strandja is vast, here on this land except with picturesque landscapes, you will become familiar with many worthy people. Men knew the country, but true friends of courage and bravery. In 1903 in the area of ​​Petrova Niva was held meeting of revolutionaries from Thrace.Then they decided to support the Ilinden Uprising and so was born the first nationwide push for accession of Strandja, Eastern Thrace and the Aegean to the free lands of the country. Petrova Niva area is located between the shores of the Danube River Youth Veleka and river on the outskirts of the picturesque village Stoilovo. The selection of the Strandja hrabartsi a place suitable for making such important decisions about the future of our enslaved land was not accidental. They chose Petrova levels because the area is surrounded by the waters of rivers, and the road to it is a difficult and thorny. 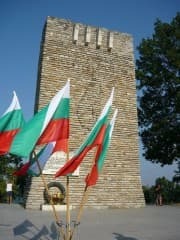 Nowadays Petrova Niva is a monument built in honor of Preobrazhentsi, brave patriots ubedinili efforts and will in the Ilinden uprising in the name of freedom of Bulgaria. As impressive monument is walled bones Kondolov George, chieftain who was head of the uprising. In honor of the age of 100 years of rebellion in 2003, the historic site was built church "St. Petka", previously the site of the temple was a small chapel. Furthermore, a monument and a temple in the area will find a museum, gathered themselves interesting exhibits of the rebellion, weapons, photographs and authentic documents. By tradition dating back to 1958, every weekend of August of Petrova Niva council is made in memory of worthy Bulgarians lost their lives to free lands of Mother Bulgaria. Organizer of the National Fair is Malko Turnovo Municipality and the Union of Thracian Societies in Bulgaria. Furthermore, as a historical monument area Petrova levels is known as a favorite place for nature lovers, here you can enjoy the beauty of Strandja, the virgin nature and the "living" life delech from the hustle and bustle of the city. Petrova Niva is one of the most significant historic sites in the Strandja region is part of a hundred national tourist sites. You can visit the historical site of the year.